Always looking for fun things to do with my kids that do not involve screens. Unless Man Utd are playing. It's hard to believe that there will only be two more weekend event guides before Christmas Day. However, that means that we still have at least another month of festive, family events to enjoy all over the country. 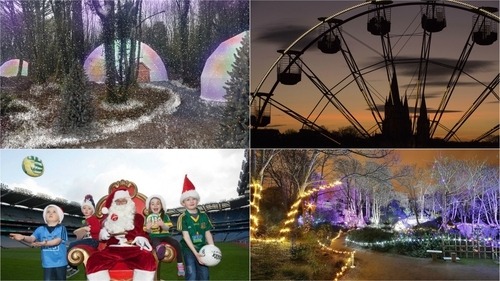 The Christmas season is wonderful for spending time with family and YourDaysOut.ie is a great place to start looking for something fun to do. We've listed some ideas for this weekend that don't all include the man in red! Enjoy some festive fun at the Collins Barracks Open Day on Sunday from 2pm-5pm. There will be Christmas carols, trails, storytelling and talks including food historian Regina Sexton on festive food. The day will also include an exhibition showcasing artworks created by local artists, members of the Henrietta Adult Community Education (HACE) and the Active Retirement Association Phibsboro and inspired by the Museum's Portrait of a Century and The Volunteers exhibitions. No booking required. Castletown Christmas Village comes to the beautiful Castletown House & Parklands in Celbridge, Co. Kildare from December 7th to 10th for a fun, family festive experience that includes unique Christmas gifts in the craft market, indoor cinema, cooking demonstrations, Santa's Grotto, carousel and more. Enter the archway of the spectacular Drimnagh Castle and savour the beautiful smell and sounds of Christmas. Browse WALK’s Christmas market, which provides a lovely mix of seasonal gifts, local artisan wares and tasty local treats. Join Mrs Claus and the elves for festive jokes, songs and stories. All proceeds will go to support WALK Community Project Fund. Cork City transforms into a festive extravaganza this month as GLOW, the annual Christmas festival returns to the Grand Parade. Don't miss your chance to soar high above the city by taking a ride on the giant Ferris Wheel. After marvelling at the city's twinkling lights from up high, sip a mug of mulled wine and sample handmade treats as you browse the food markets. Drumcliffe Church in Sligo will be decorated with over 65 themed Christmas trees that have been carefully prepared by local community groups and individuals. As well as the attractive display, there will also have over thirty craft stalls located in a large marquee, live music, festive fun and more. Proceeds in aid of Samaritans Sligo and other charities as chosen by Drumcliffe Select Vestry. Escape into a magical woodland adventure, hop on board the Santa Express Train and make your way into the heart of Castlecomer Discovery Park Woodland Christmas Experience where Santa, Mrs Claus and a team of elves await your arrival. Explore Santa’s magical Christmas Village, hear Mrs Claus telling tales about the reindeer and cosy up with a warm brew as you explore this winter wonderland. Taking place at Visual in Carlow, this is a 3-day showcase of all things food and drink in the county. Featuring nightly food stalls, giveaways and Food Demonstrations from Neven Maguire, Kevin Dundon and Catherine Fulvio with each visitor getting a free bag of recipes and some free County Carlow products to use over the festive season. Airfield Estate will be offering an ASD friendly Santa Visit on Saturday 9th December at 10am and 10:30 am, with the visit in a sensory friendly and inclusive environment. The ASD friendly adjustments are designed to make the visit to Santa more inclusive and accessible for people with sensory sensitivities, and others who can benefit from this environment. Their staff are trained in ASD awareness and are happy to help make your visit more enjoyable. Hear your favourite hymns and carols performed in the magnificent setting of Christ Church Cathedral at this wonderfully festive concert. The beautiful voices of this award-winning choir will mingle with the atmospheric candlelit cathedral to create an unforgettable feast for your senses. The award-winning, all-female choir will perform by candlelight in the magnificent setting of Christ Church on Sunday evening. The popular Elfie, Mrs Claus and, of course, Santa head to Galway this weekend with as part of Brigit's Garden Chrismas experience. The event includes lots of fun activities as well as music and entertainment in their special show. Children are encouraged to take a closer look at the natural world all around them to inspire fun art-making activities in a creative workshop especially for younger children (ages 4-7). Malahide Castle invites you to be their guest at their Christmas Experience with Belle, Mrs Potts and Lumiere. Admission includes a visit to Santa, Mrs Claus and guests, a tour of the castle, age-appropriate gift for the small ones and mulled wine & mince pies for the grown-ups. ‘Be Our Guest’ for this year’s magical Christmas Experience at Malahide Castle. This year we continue the tradition of our wonderful Christmas experience to be shared with old and young alike Santa & Mrs Claus are preparing themselves for the arrival of all the wonderful families who treasure family time and tradition. Visit Santa, Mrs Claus and special guests Lumiere, Mrs Potts and Belle! It’s time to get your skates again on for Dundalk On Ice – their real ice rink is fully housed in a festive all weather marquee so that means that rain, hail or snow you will be able to skate away to your heart’s content! They are daily in Market Square until January 7th. Located at Riverside Car park, the first ever Winterland will be filled with Christmas magic including markets, shows, Christmas activities, our magical Christmas trail and of course, Santa Claus. It runs from Friday 8th to Sunday 17th. The Maynooth Gospel Choir are playing a free Christmas concert at St. Mary's Church in Maynooth this Sunday. They will be singing at the 6pm Mass but will also have a concert from 7:30 - 8:45 where audience singing is optional but clapping is compulsory. The Lafcadio Hearn Japanese Gardens in Tramore annual Winter Light Festival starts this weekend. The magic begins as you walk through the entrance gates and you are immediately transported into a world of light and wonderment. Well, Christmas in Dublin just wouldn't be Christmas without a trip to Funderland. There will also be i-Skate and a festive Christmas market. Santa, GAA and lots of family fun. There is no business like Snow Business next weekend! Simon Delaney hosts, with music from The Nualas and the Orchestra of the NCH, guest Nutcrackers marching up the aisles, jokes aplenty from the pen of Theatre Lovett.